I find the large hardy geraniums invaluable for spring and early summer gap-filling and ground cover. They are stubbornly long-lived, put up with a lot of abuse, and look great when in flower. My favourite is this one: g.pratense ‘striatum’: Every flower has a slightly different pattern and proportion of blue and white. 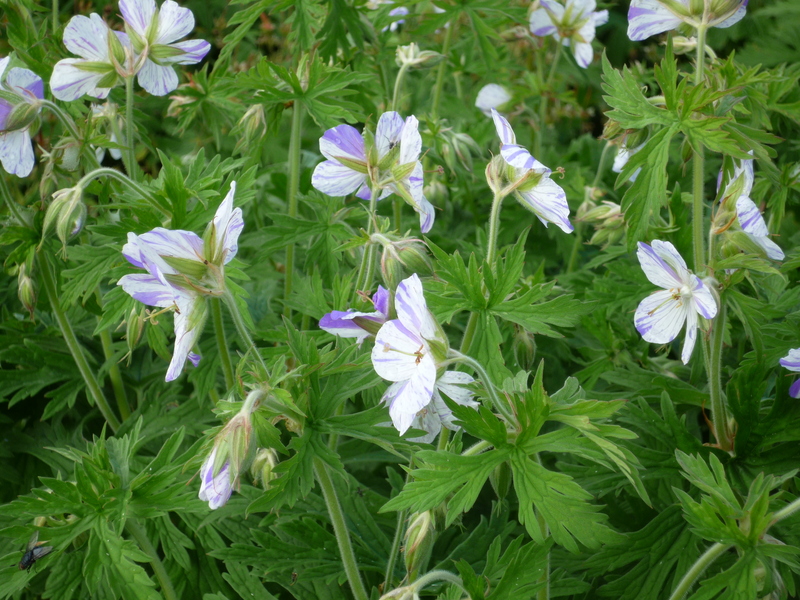 My geranium season starts with g.sylvaticum ‘Mayflower’, in early May, followed closely by g.sylvaticum ‘Amy Doncaster’, which has a smaller, bluer, flower. Then comes the invaluable g. x ‘Johnson’s blue’ (a hybrid between g.himalayense and g.slyvaticum) – a mass of sky blue flowers in June. g.pratense ‘Striatum’ is a little later than these. All the pratense, himalayense, and sylvaticum cultivars are pretty big and tough, and I grow them all together in a border which mostly consists of unadulterated clay and gravel, and let them fight it out between them. I throw a barrow-load of compost onto them every spring before they start growing, to encourage them, and they seem quite happy. If I grew them somewhere where neatness was important, I would cut them back after flowering and let them come away again, but I just let the frost do the job instead. ‘Mayflower’ seeds itself everywhere, but is easily dug up and given away to friends. If the clumps get too big, it’s easy enough to hack pieces off and plant them elsewhere – though you should do this before they come into growth. My g.pratense ‘Striatum’ came from the wonderful gardens of Jura House about a decade ago. Since then, the house has been sold to a hedge fund manager and the gardens are closed. Apparently the new owner has never even visited his acquistion. This is not a political blog, but I point out in passing that absentee landlords have been the curse of Scotland for almost two centuries, and that when a great garden falls prey to a distant owner who takes no apparent interest, we are all diminished….. This entry was posted in Gardening in Scotland and tagged geranium by kininvie. Bookmark the permalink. Beyond that I love the blue and white striped geranium! I have two pinks and Johnson’s Blue, as you say they are invaluable as the understory in borders– I will be shopping for the striped one. Blue flowers are addictive.